Step-by-Step Action Guide – Your local officials must act fast. What started as a simple idea – creating one phone number, 1-800-GAMBLER, to call for gambling help – turned into the state sponsoring just about every gambling option possible and nearly doubling the number of casino locations. This new law will allow Category 4 licensed “mini-casinos” – which are anything but “mini”! 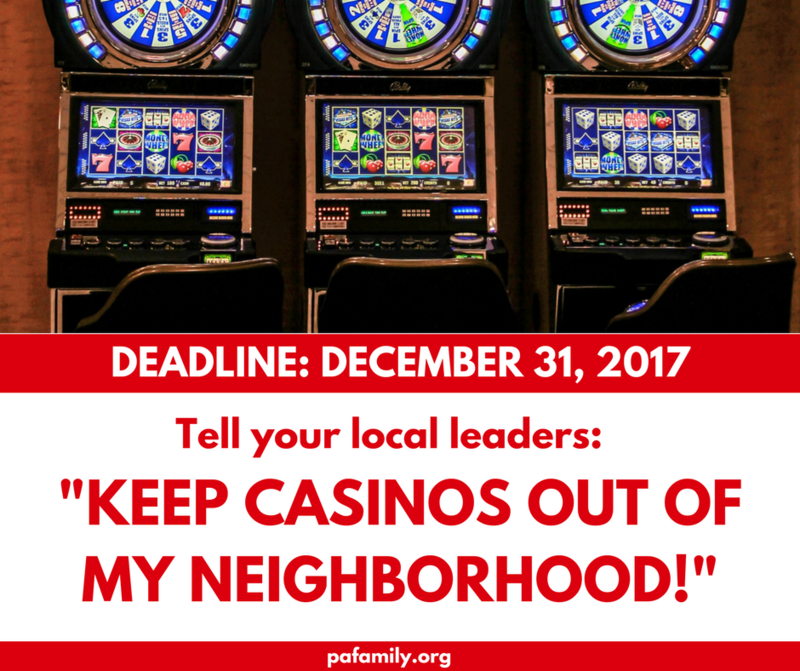 – to operate between 300-750 slot machines and up to 50 table games (black jack, poker tables) unless your local township or borough officials act now to opt out. 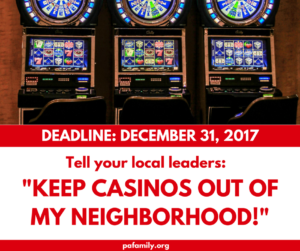 These casino locations have yet to be determined and there is a short window for local leaders to stop a casino from being built in their neighborhood. Part of this new gambling law contains a provision that any municipality can prohibit a casino from being built within their jurisdiction but your municipal officials must pro-actively pass a resolution by December 31, 2017. 1) ASAP: Tell your local municipal officials (township supervisors/borough or city council) to pass a Resolution. If you need to identify which municipality you are in, click here to find out based on your address. If you know your municipality but need to know who to contact, click here to find contact information. Sample Resolution: Click here to download a sample resolution. Reference the section of the new gambling expansion law (page 571 of House Bill 271 – Section 1305.2). The municipality’s decision to exercise the power to opt-out. The date the resolution was adopted. The inclusion of signatures or seal necessary to establish that the resolution was officially adopted. 2) Be sure your municipal officials submit an official copy of the Resolution to the Gaming Control Board no later than December 31st. If you have further questions about this opt-out provision, please contact us or see the notice released by the PA Gaming Control Board. Again, the deadline to submit this opt-out is December 31, 2017. Pennsylvania’s recent gambling expansion (HB271) is “terrible fiscal policy” (Philadelphia Inquirer). It’s terrible news for many families across Pennsylvania. For more about the legislation and a roll call to see how your elected officials voted, go to pafamily.org/2017/10/terrible.